It was a wonderful night on the ridge; quiet, no wind and only 40deg. I woke rested and slept in a bit, being lazy. Most of the elevation gain needed was yesterday and it was an easy two days of 24 miles to hwy-18. Then I checked the weather report: chance of thunderstorms tonight. Peachy. 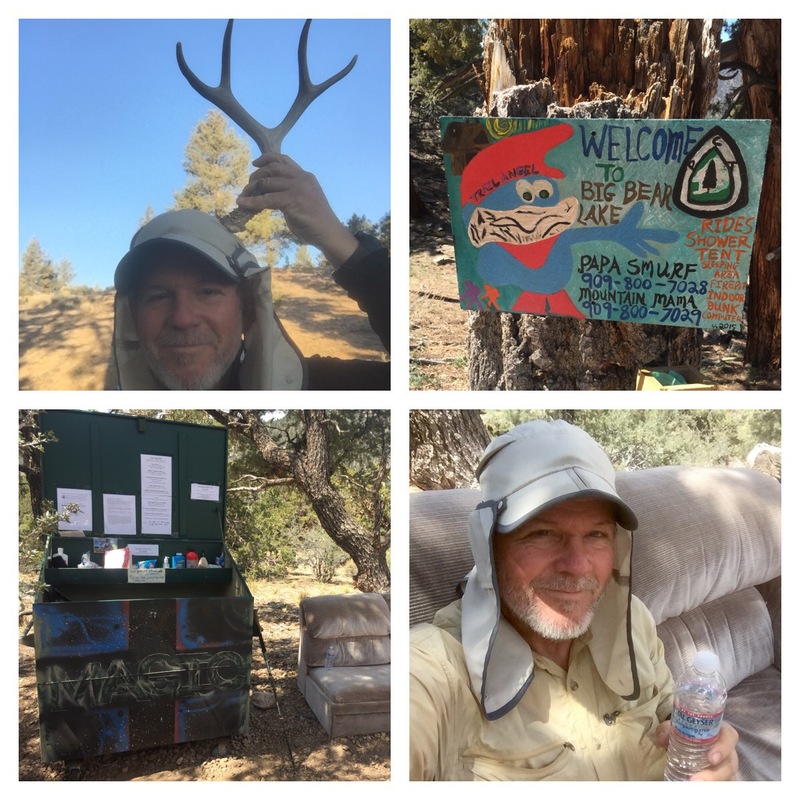 I started at 6:30am and it was a great day for hiking: Starting a bit cool but never getting above 80deg and the elevation rolled between 7,000 and 8,700ft. It was very pleasant. I made the camp I had planned at 1pm. At 14 miles it was a decent day, it was a developed camp and there was a tiny spring nearby. And I felt good. Eating lunch I thought: it’s only another 10 miles… And who wants to hike in the rain? There being nobody to talk me out of this idiot idea, I set off. I should mention that this day saw many ridge tops with views first of the Low Desert near Palm Springs and later of the other desert looking east out to Barstow and Death Valley. There was so much to see and I would normally take my time to enjoy the sights. But I was in Death March mode now. I made the 20 mile point in good time. Only 4 to go! Then 3, then 2 and I was in pain. The last four went much slower than before. I pulled into the trail head at 6:30pm; 12 hours after I started. My lower body from the hips to my feet were rebelling. Strongly. I called one of the local Hostels and they sent someone to pick me up, which was good since I wasn’t walking anywhere at that point. I arrived at the ITH Mountain Adventure Lodge (fancy name for a Hostel) and was shown around. They have several rooms with bunk beds, laundry, kitchen, TV, WiFi and they serve free Breakfast and Dinner for $20/night. There was no time to shower before dinner, but it was a simple affair of BBQ Chicken wings, mixed veggies and cold French frys. I didn’t care and ate what I could. Then shower and bed. Sigh… It’s after midnight and I can’t sleep; the beds are too soft, my body is cramping and the washer/dryer is going non-stop behind the wall. Not a great end to my day. Pictures! I found one half of a rack of antlers this morning. One of the two Trail Magic (people leave treats/water for hikers) I came apon. The one with the couch was fun. Press on Mike. Just listen to your body more! Looking forward to your next post. Was it your load of washer and dryer going? One time it happened to me in hotel, my room was next to the laundry room. I told them it was very loud, they switched it off soon after. I hope you feel better soon.